Samsung is trying to douse the flames from the growing Galaxy Note 7 dumpster fire. The company confirmed it’s working with the Consumer Product Safety Commission, the U.S. government’s arm for ensuring products do no harm, on procedures for replacing the handsets with new models that won’t spontaneously catch fire. The latest statement by Samsung says in no uncertain terms that everyone should power off and stop using their Note 7 immediately. The Consumer Product Safety Commission confirmed the issue with lithium-ion battery was leading to fires and should not be ignored. What to do next, however, is when it starts to get fuzzy. Samsung has pledged that you’ll get a replacement device, but the big question is when that’ll actually happen. The company needs approval from the Consumer Products and Safety Commission before sending out new phones here in the U.S. That means right now your best option is a refund or Samsung’s offer of a Galaxy S7 or S7 Edge along with reimbursement for the additional cost of the Note 7. The first step should be to call whichever retailer you bought the device from. Confusion may reign for a while, however. A Verizon customer had a long and frustrating experience when walking into a store to ask about a new phone as the staff didn’t quite know what to do. In the same report, another customer was told by Samsung if they wanted replacement phones right away they’d need to buy two new devices, return the originals, and then wait for a credit. Meanwhile, explosions keep happening. A six-year-old boy was burned when playing with his grandmother’s Note 7 over the weekend. Last week, Note 7 explosions caused a Jeep and garage to catch fire. To say this is a black eye for Samsung is a major understatement given the size and scope of the damage being done. 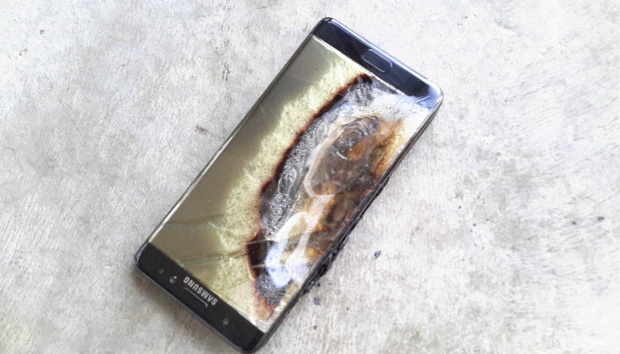 The impact on you: If you have a Note 7 the advice is simple: power it off and stop using it. Airlines are now telling passengers to power off and stow Note 7s if they have on aboard. While the number of phones to catch fire is still relatively low compared to the overall number of them out in the wild, the danger is clearly too high to roll the dice.